You can't find love in a club? Baby girl, where's your lover? 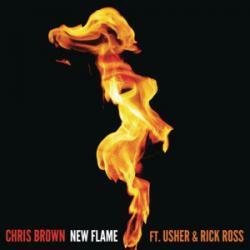 NEW FLAME es una canción de Chris Brown y Usher and Kick Ross del año 2014. La letra ha sido escrita por CHRISTOPHER MAURICE BROWN, ERIC A. BELLINGER, JAMES CHAMBERS, JUSTIN JOHNSON, KEITH THOMAS, MALISSA HUNTER, MARK A. PITTS, MAURICE N. SIMMONDS, USHER RAYMOND, WILLIAM LEONARD II ROBERTS; publicada por Universal Music Publishing Group, Sony/ATV Music Publishing LLC, BMG Rights Management. Agradecemos a Sollcittoo por haber subido la letra.